It’s getting a little bit vCloudy up in the VMware on-prem and off-prem clouds, thanks to a slew of new naming structures used to define exactly what – and where – cloud workloads are being managed. Given a number of targeted initiatives by executives looking to snazzify their data center operations, VMware has spent a good chunk of their time working on the engineering and integration checklist items around and within their various product offerings. The end goals include lowering costs for a modernized infrastructure, boosting the amount of control that IT is able to wield, and giving the business and application teams a more cloud-like feeling with speedy, continuous delivery options. But what does this all mean? It means that a loosely coupled set of solutions are now being more tightly reigned in to look and feel like a holistic solution. It also means more new names to learn. Specifically: vCloud Air for a managed everything as a service via vCloud Hybrid Service and vRealize Cloud Management Platform, often just called a CMP, for other hybrid or public clouds that aren’t run on VMware kit. vCloud Suite celebrates a new release version, moving up from 5.5 to 5.8. The vCloud Suite was released several years ago as a way to combine a suite of solutions into one product SKU and license code (for most of the items, anyway), and was designed to contain all of the necessary products to build a private cloud. With the release of version 5.8, VMware is adding a few other bullets to the list with new things! As you can see, the list covers improvements, integration points, and support for additional functionality / features. All good investments to make. The vCloud Hybrid Service, also known as vCHS or vee-CHEESE, is getting a new coat of paint and is being rebranded as the vCloud Air offering. vCHS has long been VMware’s answer to folks who want to stash their VM goodies into a public cloud offering without having to replatform the application or get tangled up in new infrastructure management and operations-focused training. One can attach the vCloud Connector appliance to bridge between an on-premises vSphere or vCloud deployment and a slice of an off-premises vCHS virtual data center. Thar be dragons in the cloud! I think you get the drift. In essence, vCloud Air offerings will describe something you can consume as a service. 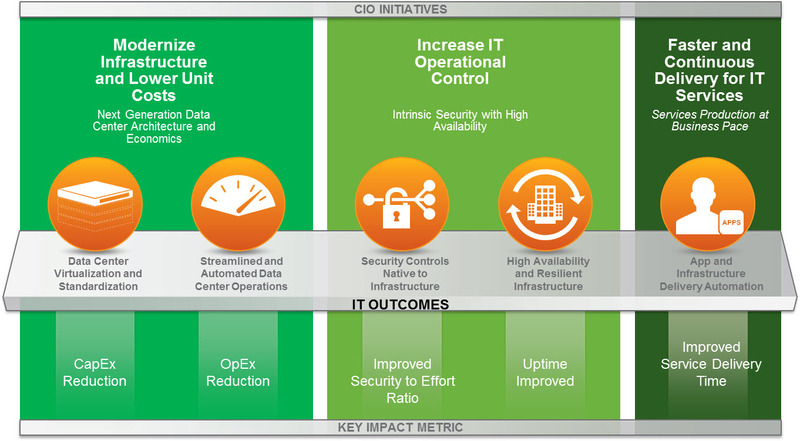 Finally, the yellow area in the graphic above showcases ideals around the vRealize CMP. According to VMware, customers are looking for options around buying and setting up enterprise wide cloud management while continuing to offer the same capabilities for operations, automation, and ITBM (IT Business Management). vRealize will be the way that these offerings are brought together, both for on-prem deployments and as methods to license and extend the management platform beyond vSphere. Again, this seems to be more of a naming and brand recognition exercise around existing products that are being optimized for interoperability and a more seamless approach to managing buckets of resources for the enterprise customer.